Do Artists’ Personalities and Temperaments dictate the Styles and Subjects they choose to express themselves? I usually do not think about things like this question on a daily basis, unless it comes up in a discussion. I am not a big fan of over analyzing and over thinking reasons for painting certain things. I usually prefer to react to the subject and be as honest as I possibly can and let it be what it will be. When I was asked to contribute to this blog, I tossed around a few thoughts and came up with a question that has come up before, and some of this I have skirted around on my own blog. I have had this conversation with artist friends and particularly students in classes and workshops many times in the past, as well as very recently. I truly believe that painters, like me, who paint an array of subject matter, and work in a particular manner, do so because of a personality, or temperament need to do so. I also find it interesting that some artists are drawn to a varied , and very eclectic subject matter, while others are perfectly content to explore only one subject…..different temperaments and personalities…..I believe. I personally choose to paint as directly as I possibly can, because I believe my temperament/personality dictates it. I am by my definition, somewhat impatient….. I guess. I feel as though I want to see things happen very quickly in the beginning of a painting. Then, there seems to be a time to slow it up a bit….. unless I plan to complete the painting in one session…..but always being deliberate and doing my best to avoid time consuming errors, which seem to inevitably occur. Some artists work on a painting over a long period of time. They glaze and layer paint. They do not mind a slower process….. and some even relish this method of working. This is a choice based on temperament or personality. There is no one best way to paint a painting. Beautiful paintings result from a multitude of styles and approaches. Over the years, I have tried many, and possibly all methods of applying paint to surfaces, and I still remain open to the possibilities in this never ending learning process called painting. I know artists who have painted in a particular way that was easy, or seemed natural for them, and were apparently never happy painting in that manner. They are now making changes, and pursuing a different path with their work. This is in my opinion, a temperament/personality decision. Many artists from my generation, including myself, made their living in the early years as illustrators painting things and solving other’s problems that might not have necessarily been their personal choice of things to paint. Sometimes one does what they have to do at that point in time. Sometimes pressures, be they economics, providing for family, etc., forces one to make concessions and one is forced off of their desired path in art. This style or manner of working discussion is also important in regards to what is taught in workshops, painting classes, etc. Many workshops and classes on painting teach, or try to teach a style, technique, or manner rather than stressing good principals. I think this might be, in my opinion, a disservice to the student. One size does not fit all in painting. Everyone wants to be an individual, and should. I believe one’s own style evolves out of practicing good solid principals of painting. Again, addressing the topic issue, one chooses a method that suits one’s own temperament, not that of an instructor. The instructor’s responsibility is to open up the possibilities with choices…..in my opinion. The eclectic subjects some artists, like myself, choose as opposed to those who paint only one subject and are known for that subject alone is a choice based on ones temperament/personality. I love painting certain subjects possibly more so than others….for instance, I probably would choose the figure over a still life, but I would not want to be limited to just figurative paintings. That is in my opinion, a personality/temperament choice. Eclectic subject can possibly have a consequence. Not sticking with one subject, that an audience can identify an artist with, can make it more difficult to become known broadly for painting that one subject. I personally would find it maddening to have to get up every day and paint the same thing or subject. I can only speak for myself when it comes to this or any matter that has to do with painting. Many artists probably do not feel that way….and that is wonderful. It certainly would be less interesting if everyone had the same attitude towards everything. This again speaks to the topic issue, temperament/personality. The aspects of an artist’s life that are effected by this issue are far reaching….. another example is how some artists have tidy, neat, everything in it’s place organized studio spaces, while others like me, are borderline slobs, and seem to be able to function, and are reasonably comfortable in messy studios spaces that might not be acceptable to some. I had an artist friend back in the illustration days who would not come past the doorway of my studio. The mess of reference books and files spread across the studio floor that I functioned in was disturbing to his sensibility toward neatness and organization. This is a personality trait of this particular artist. I was perfectly content being on the messy side of it. I think many artists paint what they are comfortable painting. Most do not go out of their comfort zone regularly. This is also a personality/temperament issue. I like to think that I take some risk, and wish I were even more adventurous, when it comes to trying new things. One of my favorite contemporary painters, Quang Ho OPAM, is a great example. He is a great painter, and also a fearless experimenter. He not only paints a varied subject, but he takes it further by continuing to experiment with his work, as it relates to paint application and things of that nature. He successfully does this while remaining a traditional, representational painter. I hope that I never lose that desire to shake it up every now and then….. even if it is just a little bit. That is my main reason for not painting only one subject. I think by being interested in a variety of subjects, it possibly keeps one fresh and keeps one from relying to much on tried and proven solutions. To some degree, one must do what they know will get the job done, but one does not want it to become familiar to the point of it being a formula. Unfortunately, in many cases, the fine art market chooses what subjects some artists paint, and in some cases how they paint. To a great degree, it is subject driven. There will always be those who want to categorize artists by subjects they paint. I still believe and hope that good painting is appreciated by those who recognize it, no matter what the subject or style. I am honored to have had the opportunity to participate in this Oil Painters of America Blog. This post is my own personal observation of an aspect of painting that I find interesting, and does not reflect that of the OPA, or any universal opinion or idea about this subject. Thanks for reading this blog post and feel free to comment or express your views. Best regards to all, and paint what you want, not what someone else wants! Hodges had a successful illustration career which lasted twenty five years. His art graced the covers of more than three hundred book covers. He worked for most of the major publishing houses in New York. Hodges was a twenty three year member of the prestigious Society of Illustrators in New York. During this time, he received many citations of merit for work exhibited in annual shows. 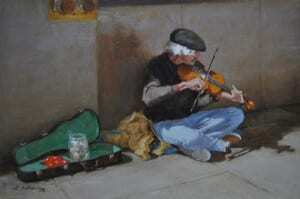 He was selected to do the painting for the twenty ninth call for entries and chaired the thirty fifth annual exhibition.